"Venezuela changes name to "Bolivarian Republic of Venezuela"
Venezuela's Constitutional Assembly on Friday approved a name change for the country, which in the future will be called the Bolivarian Republic of Venezuela. Venezuelan President Hugo Chavez has said the name change was an essential part of his "revolutionary project" to change the country's constitution. "Bolivarian" referes to revolutionary figure and national hero Simon Bolivar. Members of a style commission agreed the text of the name change, although it has not yet been decided when the name change would go into effect. " Venezuela has, if the people give a YES vote to this Constitutional change and a new name: Rep�blica Bolivariana de Venezuela. However, the Flag will remain the same. The stars represent the 7 united provinces who signed the Independence Act, on July 5, 1811. This provinces were Caracas, Cuman�, Barcelona, Barinas, Margarita, M�rida & Trujillo. "Our flag is made up of three horizontal stripes of equal width. Yellow stands for the richnesses of the territory, blue for the sea separating us from Spain and red for the blood shed by our patriots during the Independence [War]. Our national flag was brought by General Francisco de Miranda in his second expedition on March 12th, 1806 into "Vela de Coro" ; this is why the Flag Day is held on March 12th. It was recognised as national standard by Congress on July 15th, 1811 and was firstly hoisted as such on July 14th that year." Coro, which is the oldest city in the mainland of Venezuela, is directly on the shoreline. A lookout post was placed north of the city, and was named "La Vela de Coro", literally "The watch over Coro". The Spanish word "vela" can both mean sail and vigil. This later is the correct sense of this word, the place where the vigil, the watch, took place. Flags in Venezuela are made in a very informal, quite crafty way. As far as I know, There isn't any official guideline or chart for the construction of the national flag, so there are flags with smaller stars, narrower archs, longer stripes, different colours.In the current constitution, it says, about the flag, that this is the tricolori of yellow, blue and red. Plain and simple. Not much further explanatios are set in the law of National Symbols. According to [pay00], the "plain" flag (YBR, 7 W stars, no Coat of Arms) is used as alternative civil flag and ensign. National Flag of Venezuela, 1930 - Established on July 15th by disposition of the National Congress (as it must be), it incorporates the constellation of stars in arc of circle with the convexity upwards, perhaps, as remembrance of the crest that until that year enriched some reproductions of the Coat of Arms of the Republic. Still one stays effective in two variants: the one of Civil Use with its three colors and seven stars and the one of State Use, that adds the Venezuelan Shield of Arms in full color at the canton. Nevertheless, the Law of National Flag, Coat of Arms and Anthem effective from 1954 establishes in fact three Venezuelan flags: Tricolor without Stars and Coat of Arms, for Civil Use; Tricolor with Stars and Coat of Arms, for State and Military use and the one of the Merchant Marine, which would only take Stars and that the Venezuelan Soul did hers for Civil Use actually making unthinkable the absence of the Stars. 3. The design described on numeral "1" which adds only the seven stars in the same disposici�n already described, that even though it was established originally for the merchant marine concludes consolidated by popular will like Civil Flag and Ensign replacing in fact the indicated on the corresponding text. However, the prevailing situation on my Homeland has unquestionably generated a renovation and exaltation of the Venezolanity in all its most genuine expressions. Even though the Law determines a character distinction, the National Soul has assumed indifferently the National Flag (with Stars) and the National Pavillion (with Stars and Coat of Arms) like Emblem of Identity. Even more, taking as axis the design of the National flag diverse variants has been generated responding the predominant feelings, which we have come compiling to share them with you opportunely. As far as the "finial", the Venezuelan "Ceremonial Military Protocol and Regulation" in force establishes that the spear to which of leans the National Pabell�n will carry a "Moharra" with the Venezuelan Coat of Arms in relief within a contour that simulates a spear-point. In another cases, any type of "conventional" finials has been used: from spheres, to streamlined flower or spear-points; even, there are masts which lacks them. Nevertheless, the more spread custom has been to raise or to fix the National flag on spears or mast finished off on spear-points, doing an informal analogy with those of the "llaneros" (plain men) that integrated the Patriotic Forces during the Venezuelan War of Independence. In the national Venezolan flag the stars are for (hoist to fly): Caracas, Cumana, Barinas, Barcelona, Margarita, M�rida and Trujillo. The seven provinces revolted against Spain colonial rule. in last "Vexillacta" (a belgian vexillolgical review), a note about the venezuelian flag states that the 7 stars are disposed so as to have a point orientated towards the exterior of the imaginary circle of stars. according to the Law of National Symbols they could be arranged like that, as it did not specify, and we could also (and usualy) find the version of the flag depicted above: the point of th stars pointing straight up. As I've been paying attention to any venezuelan flags I see on the street (and there are many: we are on a national duel due to the mudslides and floods which we suffered last week), and have noticed both variants used in very similar proportions. My count: 35 (straight up) to 33 (circular allignment). The real national flag have the stars in arc, but standing over their two "legs", and not following the arc. Gouda's Roem, a margarine factory, issued in c. 1950 a several flag albums; text: R. J. J. Heirman (ex-teacher); drawings: Leonard Truk. Editor: van Dijk's Mengbedrijven, Gouda. 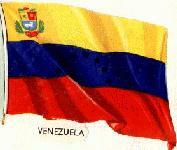 From the albums here is a Venezuela's flag with CoA in the canton and a bow of seven black stars. So, it is one is only a peculiar flag that probably is product of a press error.